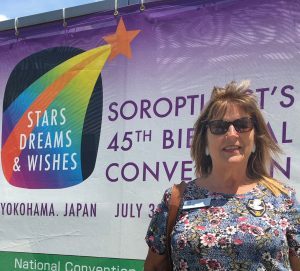 Soroptimist International of Watsonville | Improving the lives of women and girls in local communities and throughout the world. Wecome to the Soroptimist International of Watsonville web site. As we celebrate our 90th anniversary, we have 47 members – from Life Members, who have been with our club for 57 years, to our newest, youngest members, who’ve just joined us. With a wealth and breadth of experience and wisdom, we all work together towards our mission to improve the lives of women and girls through social and economic empowerment. We primarily support two Soroptimist programs: the Live Your Dream awards, and Dream It, Be It. The Live Your Dream awards assist women who provide the primary source of financial support for their families by giving them the resources they need to improve their education and employment prospects. Dream It, Be It reaches girls in secondary school and provides them with access to professional role models, mentors, and career education. Our club also focuses on providing scholarships to area high school senior girls who will be attending four-year colleges/universities, community colleges, and trade schools. If you’re looking to make a difference in the lives of women and girls in our local communities, we hope you’ll join our club. We meet every Monday from 12:15 – 1:15 p.m. in the dining room of Valley Heights Senior Community Center, off of Freedom Blvd. in Watsonville. On behalf the Soroptimist International of Watsonville club, I invite you to join us. invites you to network with other business and professional women in our community!